Today I went to ski-class - 4A. Had a nice teacher called Willy, but a dumpy class. Practically boiled standing around waiting to go. Went to Mohnenflug. I was practically crying in the queue because of Dutronc - why would he come skiing now when the snow's all gone? I didn't learn much this morning because I was only directly behind Willy for one minute. Ma and Pa had a private lesson with Sep, and Mummy broke her ski! Rather a coincidence as Pa broke his yesterday! Sat out by the pool and it was BOILING. Honestly, it was as hot as France. Everyone was wearing their bathing -costumes so I went and put mine on too. I didn't get any work done, I just imagined what heaven it would be if Dutronc was lying there beside me, holding my hand. We all looked so funny sun-bathing by the snow. I'm looking forward to the Scotch Club tonight but I wish Gail wasn't coming - I may not be asked by anybody to dance and she's bound to be. We got to the Scotch Club at 9.30 and it soon filled up. Chatted with Gail, she's awfully nice. Danced with Daddy mostly. It was so embarrassing because my zip kept on going! Then this perfectly revolting little man asked me to dance, he squeezed me and it was so revolting I got away as quickly as possible. Later a rather nice boy danced with me only he looked about 16. I spoke nearly all German to him but he spoke too fast for me. Told him I met Pol and he told me he'd met Urdo Jurgens. He asked me to go over and sit at his table which I didn't, but I was introduced to his brother and some friends. He didn't ask me to dance again. It got very hot and smokey, and at 12 we left. Saw some fab boys as we were leaving - they all sit around the gramophone area. I wish they'd dance occasionally. Oh bother, ski classes begin at nine. "We all looked so funny sun-bathing by the snow"
June, Chump and me went to the ski class at nine, and found we were going to be skiing in the Valluga all day! It was a super day, but what spoilt it was this foul man and his slop of a son, Nazi-type Germans. The father continually tried to get me off with the son, even suggesting I meet up with him when we were home. Avoiding actions were necessary the whole day. So we spent most of the time with a rather sweet Englishman. Talked a bit to Willy - his accent fascinates us. The skiing was a bit difficult at the top and poor Chump fell over and hurt her ankle, but after that it was pretty easy. Later we got the most hilarious little meat-hook - not a T-bar but a corny thing you put between your legs. Needless to say I fell off! 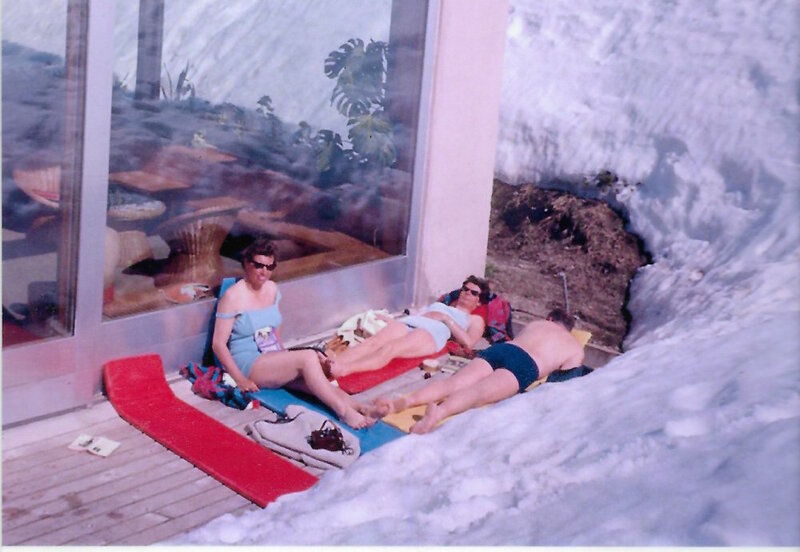 Went up to the swimming-pool terrace when we got back where Ma and Pa were sun-bathing. Ghastly news: the house has been burgled. Ma has just rung up the Reids - the house has been turned inside out and the police think it's a complete mystery. I'm so dreadfully worried they might have taken my jewellery. Had a sachertorte and went to sleep in the sun. Changed into black ripple skirt and turquoise jumper and put my hair into one bunch on the side. By 7.30 our horses and cart were waiting outside! It was so exciting getting into it, and snuggling up in the rugs... I really don't know why but there's something thrilling about jogging along in a horse and cart, especially at night. We felt so Russian we just had to shoot at wolves in the wood! It was heaven. It took about 20 minutes to get to Zug - to the Rote Wand, owned by Sep. It's a super place. Two young waiters served; it was very smart but superly informal and the old furniture is fantastic. Sep came along and chatted a bit, in his hilarious squeaky voice. 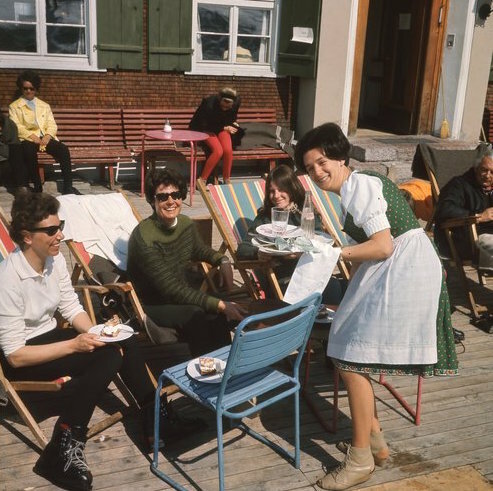 Then the fondue arrived - oh, it was FABULOUS. June, Bill and Susie had never had it before so it was extra fabulous. There were two fondue pots and two platters covered with large pieces of rump steak, and little dishes full of sauces, gherkins and lettuce. No time to talk, we were concentrating too hard on cooking and eating and exclaiming about the fabness of it all. Then we went down to the cellar place below where there was music and dancing. Such a beautiful little place, very Austrian, with German music played. There was even a DJ! In a tiny place in the wilds of Austria! The stage coach ride home was priceless: the driver suddenly pulled out a torch and flashed it whenever a car came into sight! The sky was dotted with stars. I wished more than anything that Dutronc had been there. 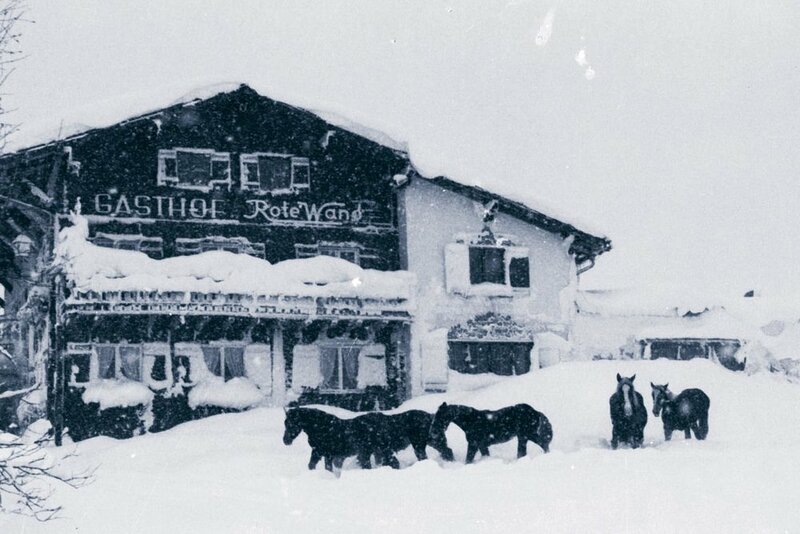 Gasthof Rote Wand - the first fondue in the Arlberg was served here in 1964. June, Bill and Susie left today. Went to the Rufikopf. Surprised to see hardly a queue. The snow was icy but really good in parts, but what was horrid was the place was deserted. When we got to the cafe at the top we found it was all closed up, I felt like crying. Decided not to go up again; we were too depressed. If only we'd come a week earlier, if only we'd left the day Easter was over. I never knew how much I appreciated queues. Had lunch on the terrace and Sep joined us. Honestly he's so sweet, he goes into peals of laughter whenever anything the slightest bit funny is said. Talked about the snobby English people who often come to the Post for lunch - Sep calls them "lords"! The little boys really get me, they've all got snobby accents and a frightfully self-confident air. Sunbathed by the swimming-pool and listened to French radio. Had a gin and tonic which I love but it makes my legs ache dreadfully. I wish I could tell Mummy and Daddy how much I miss Dutronc, but I daren't. What's so awful is that whereas I used to get so happy reading March 27th to April 7th in last year's Diary, they'll now be the most miserable pages I could read. From now on, every single page where I've got him mentioned is going to be agony. Sep brought Josef skiing. Oh honestly, he is such an adorable little boy; I don't think I've ever met such a nice child in my life. 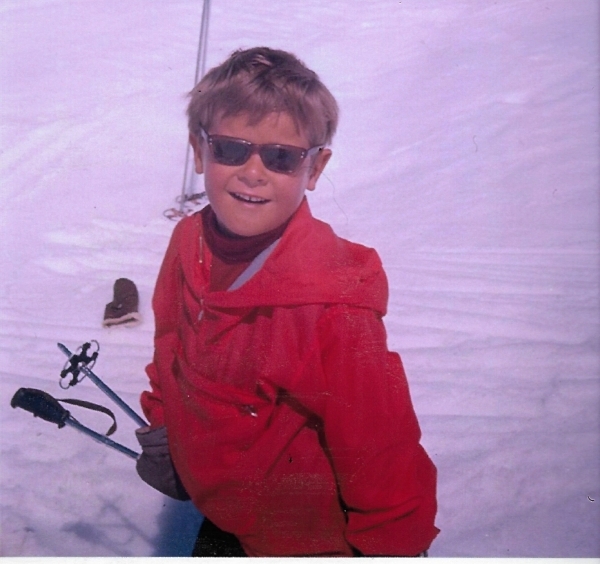 He was wearing black ski trousers and a red anorak - just like Dutronc. We took tons of photos of him and he posed adorably: the perfect photographer's model! We had the most super ski, the best this year. The weather was heavenly. We went from the Mohnenflug down to Zug, then taxi to Zurs where we did the Madloch. Stopped at the cafe at the top of the Zursersee which was gorgeous. Josef is killing, he's a terror on skis! He can do parallel turns, he can wedel, and he finishes off every run with a saucy flourish and a grin. I fell over once and he was so sweet, he charged down and picked up my stick for me. Oh if I had a child like that! They had lunch with us out on the terrace when we got back. Josef was perched on his chair looking rather thoughtful when suddenly he said, "speak English." "Do you?" we said. Then he rattled off all the expressions he'd learnt - "How do you do? - Very well thank you - Bye bye..." oh, I nearly died. He is so utterly, utterly adorable. Nearly everybody who was here last year is back again - all except Dutronc. Chump's latest is, he's on military service! Perhaps not as crazy as it sounds. 'Waited quite a long time for the train at Langan"
Leaving after all was rather sad. Wore orange dress and cloak. It was difficult not to cry saying goodbye to Elisabeth, Martha and Margaret. When we waved goodbye from the car, I almost was. Waited quite a long time for the train at Langan. Derek was on it, which was quite nice. The only trouble about Derek is that he is horribly conservative; he's quite serious when he says he hates long hair. June is the same - she thought Tony's hair was too long! I asked Daddy why it is that the people who have an artistic temperament wear longer hair and gayer clothes. He said it's because artists are always ahead of their time. It is the artists, the more interesting people, who start the changes. Someone's got to. In other words, it is utterly absurd to think long hair and unusual clothes are wrong. It was so funny as we got off the train at Zurich. Daddy, being mad, asked to be transported on the porter's trolley from one end of the platform to the other!!! Got our car and drove to L'Ermitage. Surprised to see tons of fab boys on the way, all wearing Dutronc-type clothes. The garden of the Ermitage is absolutely perfect at the moment, the grass covered with daisies, the trees covered with white blossom, and daffodils, tulips and forget-me-nots everywhere. And the shimmering lake right by. We drove into Zurich after we'd changed and walked along the Bahnhofstrasse. Went into Karl Weber and all the fab shops. Because we've got so many Swiss francs from Monsieur Gonti we decided we'd all get ourselves presents. I got a beautiful white cotton nightie with broderie anglaise at the top. Had three cakes in Sprunglis! I love Zurich almost as much as Venice. There's a long mirror in our room and for the first time for ages I'm able to look at myself. I never realised before how un-thin my legs are. We drove to the Kittenmühle at eight. It's such a beautiful place; they knew what beauty was in the olden days. First you come into that super little hall, lit by oil lamps, with a flagstoned and cobbled floor, two huge wine barrels by the wall, and a copper jug full of flowers. Had tomato soup with cream on top, trout and new potatoes, and strawberries and cream. Spoke a little about when Daddy had his haemorrhage. At one point he honestly thought he was dying, he could just feel the blood draining out of him. He says he could never fear death after that happened, because he wasn't afraid. The waiter was very sweet; had a voice like Adamo. At 9 we left for Lucerne. Swiss barns and Swiss cows are the most beautiful things on earth. The grass was very green, the trees were in blossom, and there was forsythia everywhere. Lucerne reminded me of Venice - the water, the warmth and the peace. Went into a fab Originale type shop where Daddy got the most super batik tie. I got a lot of looks because of my skirt! Walked through the gorgeous wooden bridge on the lake and Mummy did a sketch of the tower. Then drove to Engelberg where M and D went for their honeymoon. They were horrified to see how much it's changed. The little church is sweet but it's a shack town now. On the way back us two waved at this fab chap in a fab old MG. He waved back and followed us all the way into Zurich! Back at the Ermitage I wrote my Diary sitting on the steps by the lake with the sun setting opposite. The sound of the waves lapping the water reminds me so much of mooring at the trots for the night. I'm looking forward to sailing again, and hope that the fab chap at the Marina is there. At 8.30 we went along to dinner. Had scampi cocktail which was lovely but not as good as last year, then meat fondue. I was utterly full and feeling pretty sick but I had to have a sabayon to finish off with! It was warm and creamy and delicious. Felt so sick I left immediately after that and went to bed. Hair so greasy it makes me distraught. Not so bad though if behind my ears. Left Ermitage, and drove around the lakes - heavens, they're so beautiful. Went down a very winding road once which went through all the snow, we even saw some skiers. Stopped for lunch in a slopey sort of field full of flowers; took my jumper off I was so baking. Driving along one lake I kept thinking it was the Corniche, it was so identical: water (lake) on the left, rock face on the right, hot sunshine. Approaching Zurich I counted cars: in ten minutes I saw 21 Volkswagens and six Mercedes. Got to the airport at 5.30, I bought Bravo and as a result learnt masses of German. The plane left at 6.15. It was a Trident, very smooth and fast. Had a fabulous supper, and a menu with it! Cold meats, Russian salad, gherkins, rolls and cheese, strawberry gateau. Took ages getting our cases; they all came off this crummy silver thing which rotated round. There were some really drunk men cracking jokes - "hey, this is a slippery business, haha!" - they'd just come back from a Dutch football match. House not in nearly such a mess as we'd expected, dear Mrs Reid had tidied it all up. All my jewellery is there except my beautiful gold charm bracelet. I cried when I found out, I've had it since I was christened. Not much else stolen except two of Mummy's gold rattles, which is rotten, and the Braun table-lighter. He must have been an utter crank. The Reids think he could be one of the workmen at the Grange, or perhaps the snooper. So tired I had no time to unpack. "Swiss barns and Swiss cows are the most beautiful things on earth."